Of the 370 surveys sent out to local councils, 338 were returned, up from 319 for 2015, giving a 92% response rate. Not all surveys were fully completed but this is still an excellent response from councils who made the time to return the questionnaire. A 21% decline has been recorded in the number of stray dogs handled by Local Authorities in 2015-2016. An estimated 81,050 stray dogs were handled by local councils across the UK in 2016 compared with an estimate of 102,516 in 2015 which is great news and is the lowest since surveyors began 1997. 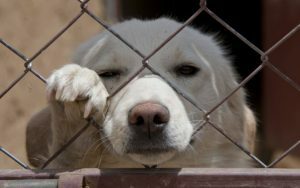 Out of the estimated 81,050 stray dogs, 78% were collected by local councils, 17% brought in by members of the public and 5% by other means (police, vets etc). 54% were returned to their owners with 36% being reclaimed within the statutory period and 18% directly before entering kennels. 22% of dogs have been passed onto local kennels for re-homing. 9% were rehomed directly by the local authority. Sadly 4% were put to sleep but because of the big drop in the number of stray dogs being handled by local authorities there is positive news in this figure. The positive news is in 2015 an estimated 5,142 dogs were put to sleep, in 2016 it’s estimated that this dropped to 3,462. Included in this figure it is estimated 901 were put to sleep for behaviour or aggression problems, 538 for ill health, 181 under the Dangerous Dogs Act with 1,842 presumably because homes could not be found. Although there’s positive news in these numbers, they still indicate that 35 good healthy dogs lose their lives for no reason every week. This is why charities like Dogs Trust and the hundreds of other small and large re-homing charities are so important to our pets and animals. Good news is definitely shown in this year’s survey, with a high 92% response from Local Authorities and the decrease in the number of stray dogs being recorded. There are also indications of a drop in status dogs numbers and the related higher proportion of these dogs being put to sleep. An estimated 35 healthy dogs lose their lives every week. Dogs Trust excellent survey only covers Local Authorities, so it is safe to assume there are many more stray dogs which are handed into local charities and not included in these figures. While 54% of dogs returned happily to their families is brilliant, this still leaves 46%, just under half, facing a very uncertain future through no fault of their own. The cost of reducing the 46% by having your dog microchipped and wearing a collar with an ID tag, including our Premium ID Tag, is under £45. The equivalent of buying a meal for two has got to be worth paying to protect your faithful pets. To read the full Dogs Trust Article please click here. Another area for concern leads us to write a further article regarding the number of stray dogs without ID tags and the number that are microchipped, however the details recorded are incorrect or out of date. Please click here to read this article.